In this method, we place a lay bet on each of the teams in our accumulator. So for a £25 accumulator with 5 teams, we are placing 5 x £25 lay bets, one on each team. This is no longer my preferred method, instead I would recommend Lock In (if you want to guarantee a profit) or No Lay (for speed but with risk). This is because this football season, the minimum lay odds are usually 1.33 or higher, meaning the Lay All At Start can no longer reduce your risk compared to No Lay, but will take longer to do! Your expected profit is the same as Method 1 No Lay, except for now we deduct the commission from the lay bets. If you haven't yet, read the Football Accumulator Refund Explained guide to see why lower back odds means more profit! * If all teams win, then you will win £35 (if your teams average 1.2 odds) up to £165 (if your teams average 1.5 odds). The issue with higher odds is that whilst you win more when your acca does win, you are much less likely to win. For the exchange outcomes, we are placing 5 x £25 lay bets. For the purposes of explaining this, let's use an example of a £25 acca where all 5 teams have 1.3 back odds and 1.32 lay odds. This means each £25 lay bet has a £8 liability. If a team in our accumulator wins, we lose our £8 liability. If a team in our accumulator loses, we win the £25 lay stake (less 50p commission on Smarkets or £1.25 on Betfair). Therefore, these are our total payouts based on how many teams win. As you can see from the above, for every additional team that loses (or draw), rather than paying out a £8 liability, instead we win £24.50. This means the more of our teams that lose (or draw), the more we make in the exchange! Our total outcome is simple summing the bookmaker and the exchange outcomes together. You can also see in brackets the likelihood of each outcome happening. As you can see from the above, we will only lose money if 1 team loses which will happen around 40% of the time. Overall, by taking the profit/loss of each outcome and multiplying them by the % likelihood, we reach our expected profit figure. This will be up to £5.40 expected profit per £25 acca, as explained above. FAQ: How Can I Minimise The Potential Loss If 1 Team Loses? You will only lose money using Method 2 Lay All At Start when 1 team loses. However, by choosing low odds and close matches via the OddsMonkey Acca Matcher, you can keep your potential loss very low by choosing low odds. Based on the above, you should always be looking for average back odds of 1.4 or lower, otherwise your could lose almost as much as using the No Lay Method. Assuming I choose average back odds of around 1.3 or lower, I would need up to £66 per £25 acca, being £25 to place the bookmaker bet and up to £41 liability on the exchange. 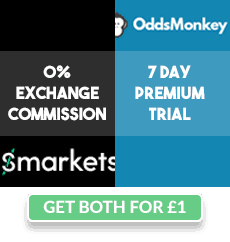 Depending on how many accumulators you are looking to do each weekend/midweek, will determine the total amount of funds you'll need across your bookmakers and your exchange(s). You may lose up to £100 to £150 if you keep getting unlucky and your accumulator teams keep having only 1 team losing, so just be aware this could happen! The above table just helps to show the importance of focusing on low odds teams. You have a lower potential loss, lower liability and higher expected profit! To start profiting from football accumulators using the Lay All At The Start method, check out the OddsMonkey Acca Matcher article.